WHIM Architecture recently unveiled their renderings for Recycled Park, a floating recreational space that retrieves plastic waste from the Netherland’s Nieuwe Maas river right before it reaches the North Sea. The trash-cleaning green space proposal was created by the architects in collaboration with the Rotterdam municipality, Wageningen University (WUR) and SK International. In addition to intercepting plastic waste, the park will also be made up of recycled plastics that will be modified to allow plant matter to grow on top. WHIM Architecture recently unveiled their renderings for Recycled Park, a floating recreational space that retrieves plastic waste from the Netherland's Nieuwe Maas river right before it reaches the North Sea. 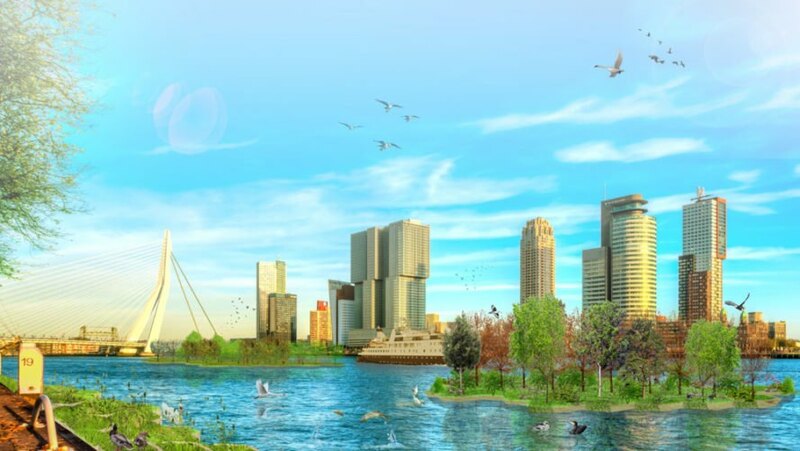 The trash-cleaning green space proposal was created by the architects in collaboration with the Rotterdam municipality, Wageningen University (WUR) and SK International. In addition to intercepting plastic waste, the park will also be made up of recycled plastics that will be modified to allow plant matter to grow on top.